This week we continue with our last book of the semester, the autobiography of Assata Shakur. For Tuesday 12/3, read chapters 4-8 (70-140). Again, make sure to pay attention to the various poems she includes in the story on pages 130 (“Love”), 140 (“Stranger”). Think also about the themes that you should now be able to identify that we’ve been working on all semester. Note specific places in the book where they appear and mark them in your text. For Thursday 5/8 I will not be able to make it, so we will not meet as a class. Finish reading Assata for Monday, December 9th. Important Reminder: Our last formal paper of the semester is due on Friday, December 6th via e-mail. Re-check the assignment sheet if you’ve lost it and be sure to have it in before the deadline. Announcement: I handed out the assignment sheet for the short paper on Thursday, due Friday, December 6th. CntmpUrbWrtComparePaper_F13. It also lives on the Assignments page. For Monday 4/29, read the first 70 pages (chapters 1-3) of Assata: An Autobiography. Be sure to read the foreward by Angela Davis and Lennox Hinds. Also make sure to pay attention to the various poems she includes in the story on pages 1,17,44, and 62. What are some of the ways you see her struggle against some of the stereotypes we saw in Marlon Riggs’ Ethnic Notions documentary earlier in the semester? Thursday, November 28th we do not meet because of the holiday. Enjoy your break and work on those papers. For Thursday 11/21 the assignment is to watch the Youtube videos of various poets from Russell Simmons’s Def Poetry Jam, which ran for several seasons on HBO. Also read Ben Brantley’s New York Times review of Def Poetry on Broadway. Assignment: Write 1 page (typed, double spaced) on one poem from the list below. How does it reflect the urban experience? Does It? Why is it appealing to you? 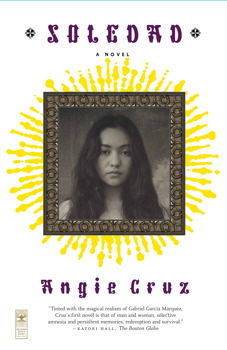 On Tuesday 11/12, we continue with Angie Cruz’s novel Soledad. Read chapters 4-5: up to page 111 in the new paperback edition. In addition to the points I made to look for in last week’s post, here are a few more things to think about in terms of thinking about Soledad as an urban narrative based on the additional info in the upcoming chapters. For Thursday 11/14, read chapters 6-7 (page 164 in the paperback) of Soledad. Continue tracking the themes we’ve identified and how characters develop in the book. Tato Laviera, one of the key people in the Nuyorican poetry movement, has died. The New York Times has an obituary. The ClassAction Student Group is sponsoring a daylong hip hop history summit at Lehman on Friday the 8th! See their site for schedule and details. On Thursday 11/7, we turn to Angie Cruz’s novel of Dominican immigrants in Washington Heights, Soledad.